Currently in its second generation, the front-wheel drive Hyundai Azera sedan offers motorists even more features for 2015 with exterior and interior design enhancements combined with new standard safety technologies. Newly standard features include illuminated door sill plates, a hands-free Smart Trunk opener, an eight-inch color LCD navigation display, and a new center stack design. Available in Base and Limited trim levels, exterior changes include a redesigned grille, front and rear bumper fascia; new 18-inch alloy wheel design; and newly available LED fog lights on the Limited model. In addition, the Limited model includes features from last year's Premium package as standard equipment. The 2015 Hyundai Azera sedan represents an advanced approach to the traditional premium sedan segment by delivering a powerful yet efficient powertrain, modern design, and luxury features. Azera continues to offer customers the highest levels of luxury, performance, and efficiency, all brought together in an innovative design. Azera's elegant look continues inside to the passenger cabin where Hyundai has created an upscale ambiance, thanks to a flow-through center fascia and instrument panel. These flowing surfaces complement the exterior design and wrap around the driver and passengers. The Hyundai sedan offers luxurious appointments that rival the finest premium competitor brands. It offers a roomy cabin with more than 45 inches of legroom and 40 inches of headroom for front-seat passengers. Special attention has been paid to other interior details, such as an optional panoramic sunroof, which allows more natural light into the cabin and 3D Carbon interior accents. Ambient lighting compliments the vehicle's modern appearance. The Azera offers first class seating assignments for all passengers. Leather seating surfaces are standard. A ten-way power driver and eight-way front passenger's seats are standard equipment. The driver's seat has an optional cushion extension and an integrated memory system for the seat, steering wheel and side mirrors. Azera's climate and seat temperature controls keep occupants in total comfort. Optional ventilated front seats fans in the front seat back and bottom cushions circulate air through the perforated leather seats. In addition both heated front/rear seating and a cooled glove box are standard. EPA Fuel Economy: Base - 20 city/29 highway; Limited – 19 city/28 highway. Dual front airbags, front seat mounted side-impact airbags, dual head curtain side-impact airbags, rear outboard side-impact airbags, drivers knee airbag, four-wheel disc brakes with anti-lock, electronic brake force distribution, traction control, vehicle stability management, front fog lights, automatic headlamps, daytime running lights,blind spot detection with rear cross-traffic alert, lane change assist, Bluetooth hands free phone system, automatic power door locks, remote keyless entry system, proximity key entry with push button engine start, rearview camera, HomeLink integrated transceiver, engine immobilizer, tire pressure monitoring system, navigation system and Blue Link telematics. Limited adds Xenon high intensity discharge headlamps, automatic high beam assist, LED front fog lights, rear parking assist system, lane departure warning system, and forward collision warning system. 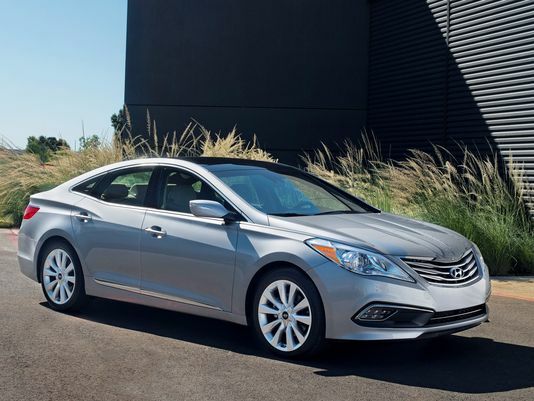 The base Manufacturers Suggested Retail Price (MSRP) for the 2015 Hyundai Azera sedan starts from $34,000 for the Base model and $38,200 for the Limited. Destination charges add $895.